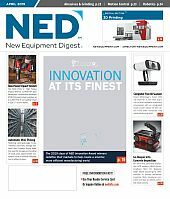 Interested in a product you saw in the pages of New Equipment Digest? NED has made it easier for you to respond, with our new improved online reader service card. BIMBA MANUFACTURING CO PNEUMATIC. ELECTRIC. HYDRAULIC. VACUUM. ALLIED POWER PRODUCTS (COLUMBIA) MORE PULL. LESS BULL. NU-STAR (POWERPUSHER) NEED MORE MUSCLE? EXAIR CORPORATION MACHINING WITHOUT COOLANT! MILL ROSE CO. WE LOOK AT BRUSHES DIFFERENTLY.